We help brands find and cultivate the best digital channels to successfully forge meaningful relationships with customers. Tourism & Hospitality marketing solutions to capture the imaginations of travelers. Be the destination where they stay, dine, and explore. Digital marketing solutions for businesses that want to amplify their marketing messages, develop new products & markets, and create value. Local SEO, Paid Search, and Social Media solutions for wineries, experience and activity companies, and lifestyle companies. SEO is a cost-effective way to introduce new consumers to your brand and build long term value. We understand how organic search plays with paid search, social, direct sales, and other channels. Working with you, we develop digital marketing strategies to incorporate the best SEO practices, staying a step ahead of your competition. Developing a strong technical SEO strategy and on-page SEO strategy are the cornerstones of our process. Clients work with us when they need complex technical help or simply need a partner that will keep pushing the envelope ahead of competitors. We develop paid search marketing campaigns for companies that need to establish a strong sales channel through search campaigns, content campaigns, video paid search ads, or remarketing strategies. Our experience in leveraging the cross disciplines of paid and organic search allow us to capture cost effective traffic. We build campaigns from scratch or will perform an audit and take over an existing campaign – Adwords campaigns are an asset, let’s put them to good use! Our expertise in researching the right keywords to target, planning for expansion of your campaign and quick and effective implementation allows for measurable results. Choosing which channel to place emphasis on depends on where your target audience is located. With experience spanning a decade as a trusted digital marketing partner for many companies, we continue to be an expert at creating, managing and cultivating a social media strategy that drives results. The right voice is important and our strategy incorporates the right voice, brand and customer experience that your brand needs. Contact us for help creating a social media strategy development plan, a social media management partner, help with reputation management and in person social media training. Email marketing is one of the highest ROI activities that a company can be doing in their digital marketing plan. Whether you’re interested in building an email list and expanding your brand’s reach, or activating old customers to reengage with your company, we can help. We are experienced in using several email platforms such as MailChimp, iContact, Constant Contact, Bronto, and others. Creating new templates for your email marketing program, managing your send schedule, and optimizing your email list are all areas where we help clients. Contact us today and start creating a more effective email marketing campaign. We provide Conversion Rate Optimization services that employ several conversion rate optimization best practices along with envelope pushing ideas. Using CRO tools is half the battle – knowing what the test and how to read the results and implement a strategy that drives up conversion rates in the rest of the battle. We work with ecommerce sites, hotels, resorts, B2B, lead generation sites, and local businesses that all have the game goal – more conversions. Contact us and let’s build a strategy that converts your website visitors into more sales. Website development projects that we take on typically are not large in scope, but they are done right and done withing a reasonable time. We work within the frameworks of WordPress, Drupal, Magento, WIX, Squarespace, and other typical website development platforms. SEO is built in. Yes, Content Strategy is included. Google Analytics tracking is a must. Your brand guidelines are followed to a T. Contact us today and learn how our website development services can help your squeeze more traffic and leads out of your website. We specialize in creating unique destination and hotel marketing plans that capture the most relevant traffic through untapped digital marketing channels. Our digital marketing strategy, coupled with a strong understanding of hotel industry trends and experience in online marketing for hotels, means that your destination will stand out, drive more traffic, and capture more bookings. 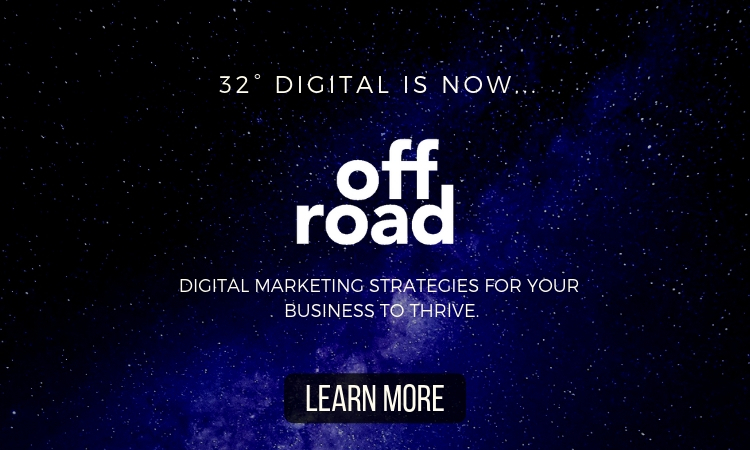 32° digital was created under the premise that small to large hotels deserve world-class attention of digital marketing strategies from a company that knows how to marketing a hotel, both online and offline. We are a hotel marketing company with experience and we will push the envelope, keeping you ahead of the competition. 32° digital’s CRUSH WINE TOURISM program is built for wineries that want to stand out in their market locally and successfully sell nationwide. Whether you’re interested in being noticed nationally or build your targeted local email marketing list and club memberships, we have the experience to quickly get you up to speed. Our digital marketing agency for the wine industry combines experience and passion for a quickly changing industry. We work with small boutique wineries and large national winery businesses that need to create conversion focused websites, engage with their consumers and build a brand. Expand your brand. Drive more local leads. 32° digital’s SeniorHeart program is built for businesses and franchises in the senior care industry need to capture leads quickly in their local market and build a longer-term strategy with content and other digital assets. We work with senior care franchises, senior living centers, and other supporting companies that are working within the growing senior care industry. With over 4 million seniors retiring each year and many new generations starting to look into care for their loved ones, it’s an opportunity to own your local market for senior care, retirement communities, assisted living facilities or independent senior care. Our digital marketing agency for the senior care industry combines experience and passion for a quickly changing industry. We work with small senior care franchises and large national assisted living businesses that need to create conversion focused websites, engage with their consumers, and build a brand. When you’re a broken pipe, fire or natural disaster hits, your business should be the first one called. Consumers will turn to Google, using their phones and possibly voice search to find a solution to their immediate clean up needs. We make sure that your residential restoration company is found when customers are looking. A cornerstone to our strategy is understanding how customers are searching for you, then we leverage content, social media, paid search, and email as a way to connect with them better. We work with commercial restoration & residential restoration customers around the country drive more leads for their business.